Christine’s email address is no longer valid. However, this duck was one of her most favorite toys. When she asked me where her duck was, I explained to her the tornado had taken it. She quickly asked why the tornado had taken it, to which I replied, “Because the tornado was mean!” She then asked if the tornado was a doll-coaster? “A What!? !” “A doll-coaster.” This caused a look of confusion between my husband and me, and then my husband grinned and said, “You mean a disaster?” “Yes” This was such a Rugrats moment!! Love this kid! She has sooo much character! Oooooo, just found this one!!!! FANTASTIC!! Shipping is high, but maybe they can get it for a good total price. At least now we know it is a DanDee. Thanks, Tara!! I am putting my bid in! Thank you soooo much! I will let you know how the auction goes!! Not sure if you got that one Christine but there is this one too? I want to thank you all so much for your help!!! 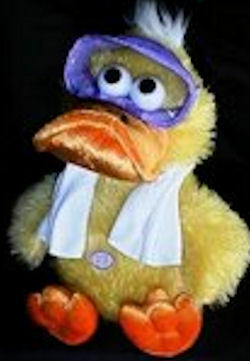 The duck has been found and I am anxiously awaiting it’s arrival to see the look on the grandbaby’s face!!! Thanks to all of you who are gracious enough to spend your time helping others!! GOD BLESS YOU ALL!!! Our duck never arrived…so we are still looking! Not sure if there was a miscommunication or what, but lost the emails that were exchanged and am just now finding this to let you know! We are still very much still wanting the duck!! I can’t tell you how happy this makes me! My granddaughter’s birthday is coming soon and it would be the best present i could give her!! She still asks about the duck!If you can send me an email with your address we can figure out how to get all this arranged! Thank you sooo much! This one is on ebay if you are up for trying again. Hope one of these works out for you! Thanks, Kathy! Since several have been found recently, with no response from Christine – I’ll discontinue the search if we don’t hear from her that she’s still looking.